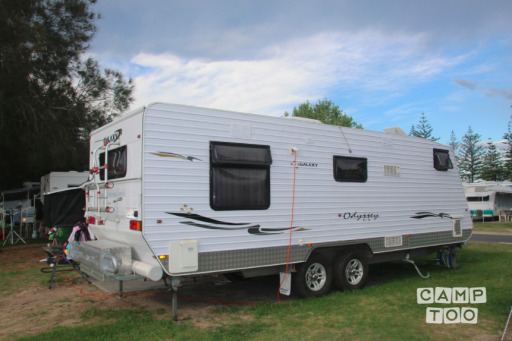 This is an awesome caravan and perfect for family holidays. Queen size island bed and two bunks in separate closed off room. The top bunk can be removed if you wish to use the bottom bunk as a lounge for sitting. This van has a separate toilet and shower and a washing machine also. Everything you need for cooking is included, all crockery, cutlery, pots, kettle toaster etc. There is a convection microwave and a gas cooktop with a gas grill. A large 180 L Fridge with a separate Freezer Unit which runs on 240 volt as well as gas. There is a 100 amp Battery to run the lights, stereo and TV if you are camping without power. A TV/DVD unit swivels from main bed to lounge area which has a L Shaped Dinette. Reverse cycle air conditioner on the roof with All Seasons hatches both ends. If you are booking a site for this van please specify that it will take a 24 foot long caravan. Please enquire for a quote for delivery and pickup, price depends on distance. Complete set up is also available for an extra fee. The van has an easy pull out awning but we also have a full annexe available as an extra. Bike Rack at rear of van for two full-size bikes. Electronic brake controller must be supplied by hirer. Minimum 4 days hire off peak. School holidays around 2 weeks minimum hire. Shorter bookings may be available if there is a gap between bookings, Please enquire for availability.